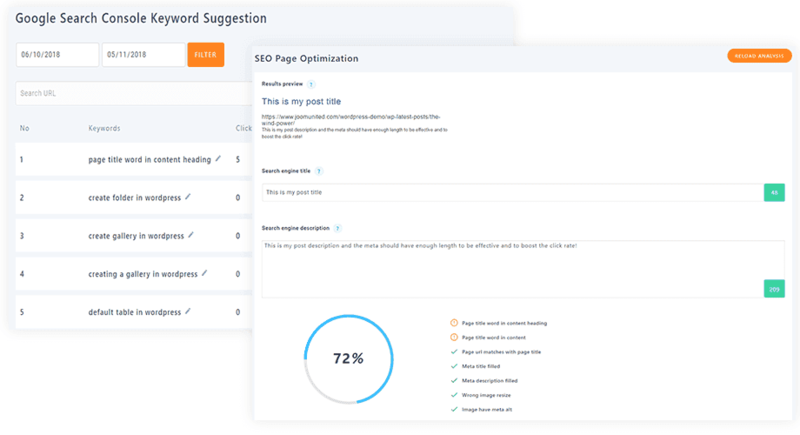 WP Meta SEO is a SEO manager for your WordPress website that use effective tools to help you get a better SEO rank than your competitors. WordPress is an amazing tool to manage content but you can also fall into some SEO trap. We’re here to help. The on page analysis tool will run some tests on the content you’re currently editing and gives you a global score. The main goal of the test is to avoid SEO errors and optimize your content for search engines. The on page optimization can be done from all content: page, post or custom post type. 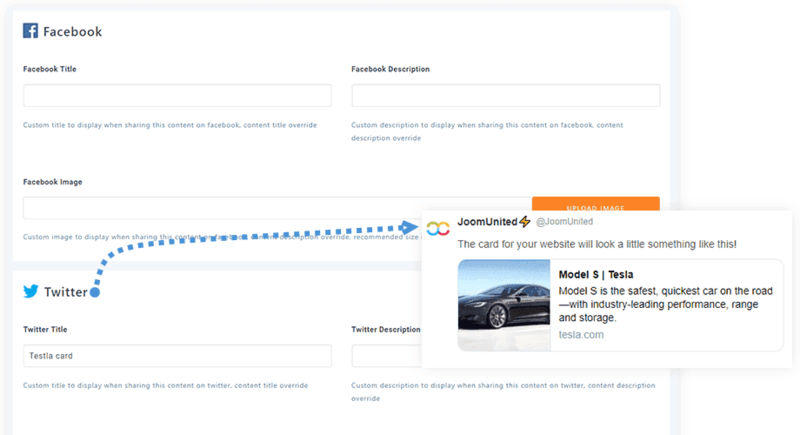 The social sharing tool will help you to define the content you’ve chosen to be displayed when a user share your content on social networks. For example, define a custom image, page title and description dedicated to Facebook sharing. The meta are used by the search engine to display a better page title and text excerpt in search results (not for indexing content directly). You can use the on page optimization to fill your meta during the content creation or use our bulk editor to make the things faster later. Type your meta content, it’s automatically save in AJAX. If you’re running an Ecommerce website or using any custom post type like an event manager, WP Meta SEO will work. 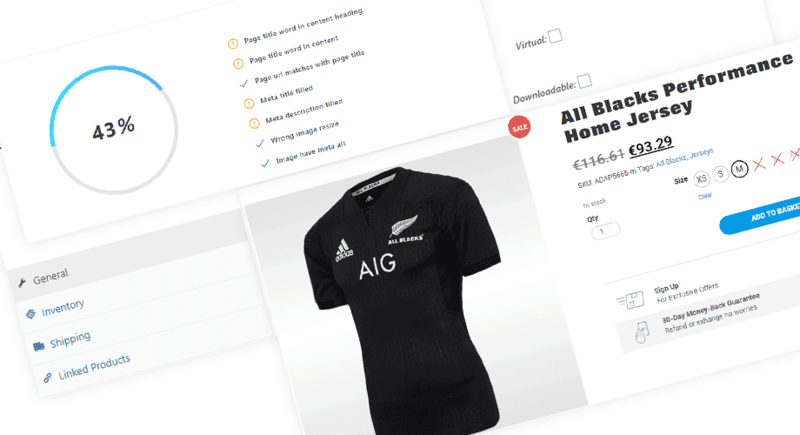 From your WordPress product or custom post type or from the bulk editor you’ll be able to fill all the info. 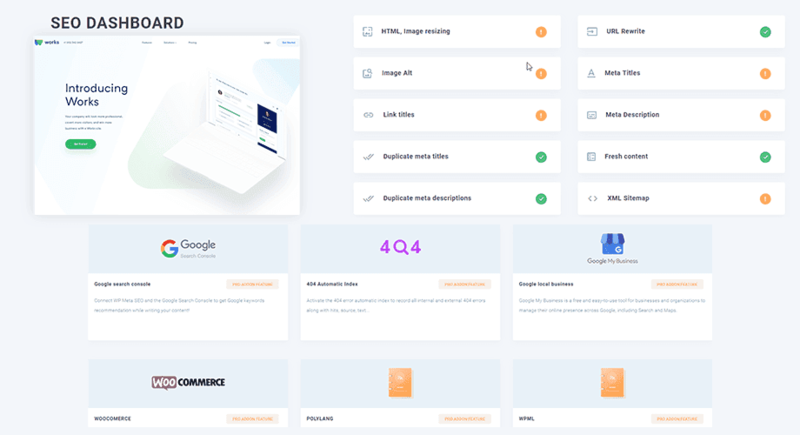 The redirect manager will index all the 404 error generated on your website with the number of hits, source, text… Then you’ll be able to redirect to any URL in one click. For a quick fix your can redirect all 404 pages to home page or you got options for your 404 pages. You can use the 404 page usually provided by your theme or custom your own. The HTML resizing is usually done in WordPress using handles on an image in the editor like bellow. It means that the original image size will be loaded even if the display size is different. This is a big problem because loading a 3000px image displayed @ 300px can be really bad regarding performance and display quality. 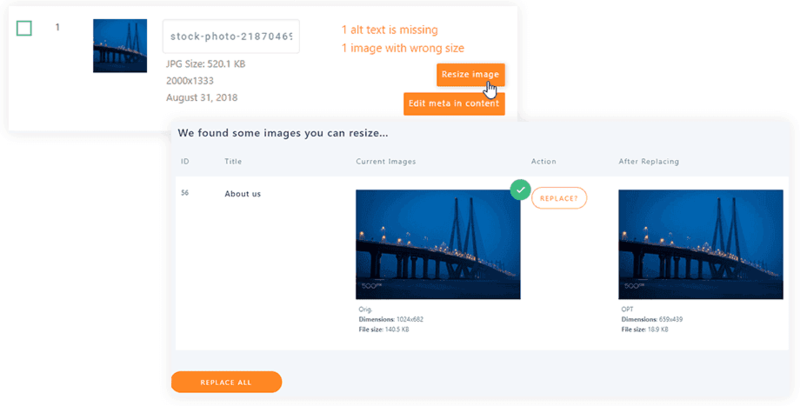 You can now fix that automatically and dynamically replace images in your WordPress content, even if the image is used in several content (page, post…). SEO optimization is therefore hard to imagine without Google analytics analysis. We’ve included in the plugin an easy way to enable Google Analytics tracking in 2 clicks. 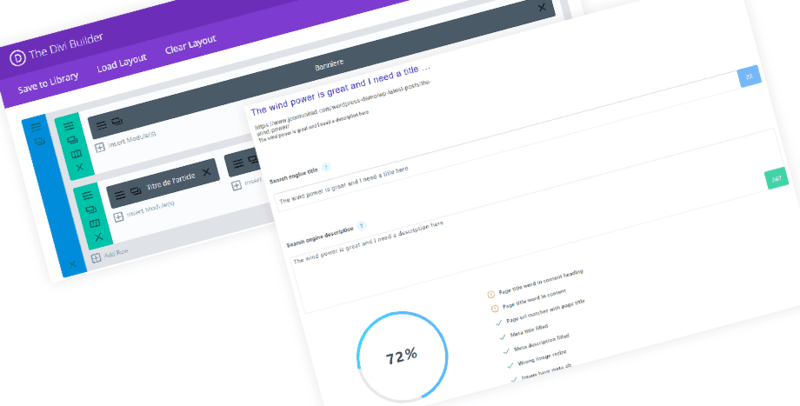 Then, from the WordPress admin you’ll get access to all the stats that matter with graph view, clean data tables and up to 100 different statistics screen view. WP Meta got an integration of the ImageRecycle image compression webservice. Images usually represent from 60% to 70% of website page weight, an image optimization (compression) will reduce image PDF sizes by up to 80% while preserving the quality. Page will be displayed faster, is good for your users and for your server. The link title attribute does not have any direct SEO influence in ranking BUT it can influence click behavior for users. In this case, indirectly, it affect SEO. That’s why we develop a tool to add the link title to the WordPress default link manager and build a mass link manager editor. From the bulk link manager you can choose witch link you want to follow or not. 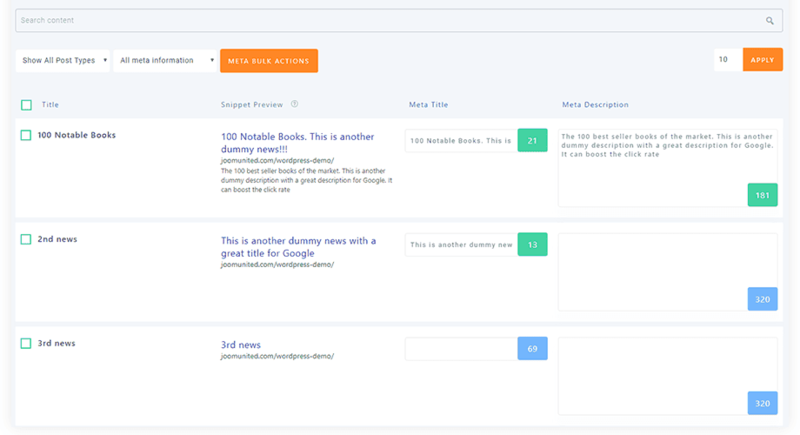 Plus, we’ve added an indexation tool that find and index all links from your content. From your content page or post or custom post, you can determine wether you want to index and follow link and content.